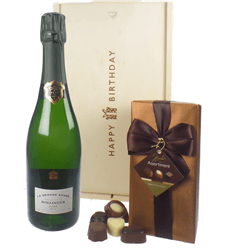 A beautiful birthday gift which consists of Veuve Clicquot Champagne (75cl) together with a luxurious (250g approx 20 chocolates) ballotin of assorted Belgian chocolate truffles. 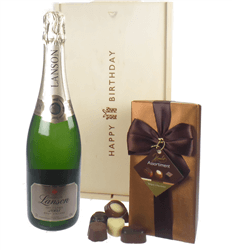 This gift is presented in our 'Happy Birthday' branded wooden gift box and is lined with wood wool. Personalise this gift by adding your own personal gift card message. Veuve Clicquot is a leading champagne house. Since its creation in 1772, Veuve Clicquot played an instrumental role in establishing and evolving the champagne industry as we know it today. Philippe Clicquot, a banker and textile merchant, who began to build the business up. After his death, his then only 27 years old widow, Barbe Nicole Clicquot Ponsardin, took the reins and refocused the family business solely on Champagne for the wealthy, noble and royal. The Veuve Clicquot vines are absolutely one of the best in the Champagne region, both for their size and their quality: 382 hectares, comprising 12 out of 17 Grand Cru and 18 out of 39 Premier Cru, which delivers 26-28% of the Maison's provision. Its extensive vineyard holdings, many originally purchased by Madame Clicquot, stretch throughout the top-rated areas of the Champagne region and are unparalleled in size and quality. Veuve Clicquot began making vintage champagne and it was the exceptional 1811 vintage or so called "comet vintage" that made the house famous. Madame Clicquot's death in 1866 was a great loss to the house. The house remained in family control until 1987 when it was acquired into the LVMH group of luxury brands. Veuve Clicquot is a spectacular house to visit and offers a variety of tours at their house in Reims (45 minutes outside Paris), including an hour-long tour of the several-hundred-years-old chalk quarry caves where the bottles have been stored for years. Veuve Cliquot Yellow Label brut is a perfect example of harmony between delicacy and power. Dominated by Pinot Noir, this wine has a firm structure, rounded with a touch of Pinot Meunier. Made from an assemblage of 55% Pinot Noir, 30% Chardonnay and 15% Meunier in a dry (Brut) style which is fairly typical in terms of traditional Champagne. We offer a vast range of fantastic Veuve Clicquot Champagne Gifts. Delicious Belgium chocolates and a bottle of Champagne are perfect to celebrate a birthday. Our extensive range of Champagne and Belgium chocolate birthday gifts include Champagne brands from Veuve Clicquot, Moet, Laurent Perrier, Bollinger and many more. 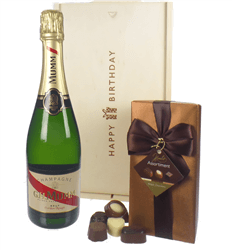 Choose which Champagne you would like to send and we will deliver it with a box of Belgium chocolates, beautifully presented in our Happy Birthday branded wooden gift box with your own special gift message. 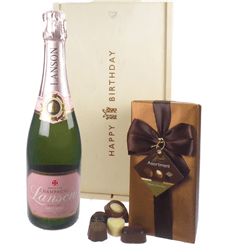 Simply order online or by phone and will deliver your birthday gift on the date of your choice.